Q: How did I get here? From owning a Beauty Biz to developing a Pet product? Jill Stephens: In 2013 I had Basil Cell Carcinoma on my nose. After several surgeries to remove the skin cancer and then even more to make sure my nose looked as natural as possible, I could only kick myself for the hours of unprotected sun worshipping I did while growing up in Southern California near the beach. Now in my late 50’s, I know your skin “never forgets” and I use cover ups, hats and tons of sunscreen whenever I’m outside or on the boat. Q: But what about my dog? Jill Stephens: While out at the river, I noticed that my best buddy, Cody Joe, was starting to see some effects of the sun as well. His nose was becoming a lighter color and dark spots, like a freckle or sun spot, were also showing up. I showed my Veterinarian and he said it was all due to sun exposure and that I should be using some sort of sunscreen on him. After lots of research and studying way too many chemicals I could not pronounce, I found that most of the ingredients that we humans use are not only dangerous, but even poisonous to animals! With nothing on the market specifically targeting nose protection for animals I hired a chemist and started to develop what eventually became My Dog Nose It! And the rest, as they say, is history. If you would like to order My Dog Nose It use promo code pet25 for a 25% discount! Milo and Otis – an adorable kitten and a silly pub enjoy fun and adventure and warm your hearts! Turner and Hooch with Tom Hanks and a very friendly / slobbery French Mastiff. Not a dog person?? Maybe you just need the right dog!! Lassie – the sub-line is, Best Friends are forever. Lassie is the dog of dogs, friend, protector, great communicator and able to exhibit love! A great feel good movie! Lady and the Tramp – such a great Disney movie and one of if not the first movie to bring up the fact that all dogs deserve a home, a stray should not be left on the street to fend for itself. This movie is beautiful in its animation and its story. Homeward Bound, The Incredible Journey – this is one of my favorites and I could watch it every week. It’s hysterical, a great adventure, and extremely touching all in one movie! Also, watch the original from 1963 “The Incredible Journey” it’s the original and full of all the emotion and joy of the newer one we are all so familiar with. All Dogs Go To Heaven – A great oldie but goodie family movie that lets us see the amazing compassion that can be shown in both people and dogs. Beethoven, 2nd, and 3rd! These are such funny movies that show us how much fun life can be with a dog! And when it’s a giant dog it can even be more fun! UP!! Not just a film about dogs, but Dug is one of the most lovable dogs ever and a key component in the relationship between Mr. Fredrickson and Russel!!! Touching! K 9 – An awesome movie about a working dog, Jerry Lee, that works with the police force to track down an elusive criminal This movie really displays the intelligence of some dogs and their ability to work with a human counterpart and not only display affection, but do their job even in the face of danger. The original animated 101 Dalmatian’s – a great film that shows family, commitment, and love all while taking us on an exciting adventure with Cruell De Vil as the villain! Marley and Me – a heartwarming movie that displays the ups and downs of dog ownership. It’s all rewarding, but it’s now always easy! Old Yeller – Too sad for some, but a classic from 1957! This movie centers around the relationship between a dog and a boy set in the late 1800’s. The film highlights the love dogs can give and the good they bring out in people, it also painfully shows the pain of losing a dog, but helps us remember that our memories are worth it! Coming soon A Dogs Purpose! Research has shown for the past 25 years that living with a pet lowers your blood pressure. There are very few relationships in life that are unconditional, and being the parent of a pet is so fulfilling and soothing that the benefits allow our whole bodies to relax. Many holistic people say instead of blood pressure medicine try owning a pet first and see the results! Pets also lessen anxiety in people’s lives in many ways. People that are anxious about being alone have a dedicated companion, people afraid to go out by themselves can take their best friend and always have someone to talk to. Anxiousness can be overcome by petting a dog and feeling them lean into you, or a wet nuzzle or just having your pet sit by you. Coming home from work and seeing the friendly face of our pets can help us forget the traffic and the problems at work and destress! Having a pet and taking care of them gives us a good feeling about ourselves. We can feel successful just by having a happy, healthy pet. As people get older having a pet gives them a reason to get up and get going, walking a dog gives elderly people not only a purpose, but exercise and companionship. Also, being a pet owner makes us happy, confident, and loved! and woman’s best friends! We love dogs and we love dog-people, people who are enthusiastic about the wellbeing of these amazing four legged family members! rescues, animal centers and fostering organizations! We hope that through our apparel for people and for dogs we show our enthusiasm and desire for all dogs to have a loving home and for all people to cherish the friendship, love, compassion, and security that dogs bring to our lives! This is Samantha and Jak from the SUP Connection located behind the Courtyard Marriott in Liberty Station. 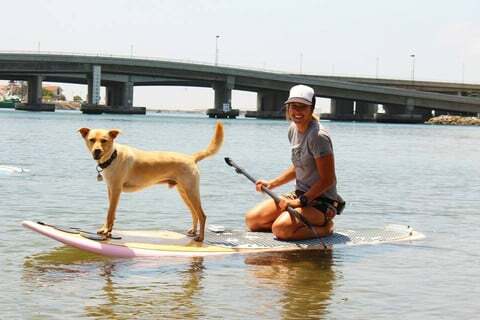 They can teach you and your dog all about Stand Up Paddle. The lesson starts right there, first the dogs get to get out all their extra energy in a safe play area, and then they walk down to the sandy beach where you and your dog will learn the safety and basics of SUP! Jak the lab / dingo is a great inspiration to all dogs, he loves SUP! A 1 hour sesion takes you out on the water under the North Harbor Bridge near the Navy Dolphin Training Facility where you can see dolphins and more amazing sites! Dog treats, action photo’s and water is provided. You just need to bring your best friend, a desire for adventure and enjoy the beauty of San Diego!